Elixirs are very similar to smoothies and a nice change of pace when it’s cold out. Think of elixirs as warm, creamy, frothy beverages that are often considered medicinal drinks because they’re typically made with a curative tea. If you’ve never had an elixir, pick a recipe below and treat your taste buds. What would I do without these warm drinks when the temps are cold and the snow is flying? 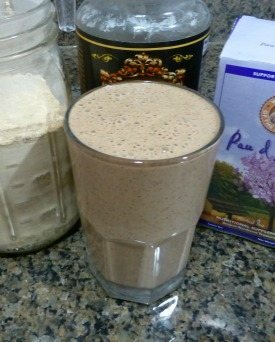 This recipe is similar to some of my other elixir recipes except for one little twist – the addition of peanut butter. The peanut butter adds a little body and provides a nice dose of protein. There’s nothing like a warm, creamy, chocolaty elixir to start your day, especially when it’s chilly outside. I love my smoothies, but once winter sets in here in Michigan I change gears and blend up elixirs to ensure I have the best day ever. 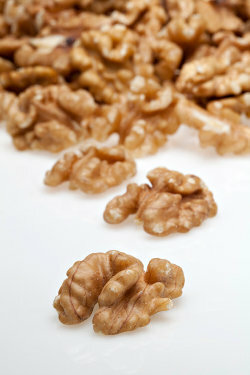 Believe it or not this is my first recipe featuring walnuts. There will be more to come featuring this healthy nut. Hello warm, chocolatey, gingery goodness! The ginger cookie taste I was aiming to recreate didn’t quite happen. However, this is still one flavorful and nutritive elixir. This recipe is loaded with spices that offer myriad health benefits. The star spice of this recipe, ginger, delivers potent anti-inflammatory action, rivaling non-steroidal anti-inflammatory drugs. 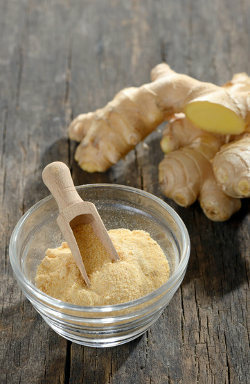 Ginger is perhaps best known for settling an upset stomach and providing gastrointestinal relief. It has also been implicated in protecting against certain cancers and is an immune system booster. Elixirs replace smoothies in my regimen when there’s freezing temps and snow, which is about 4 months a year living in Michigan. As with smoothies, I recommend developing a go-to elixir or two. My staple elixir is tailored to my personal nutritional needs and health goals, as should yours. Having a go-to elixir takes the guesswork out of what I’m having for breakfast and allows me to stock up on ingredients in bulk. 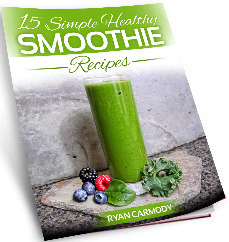 I’m extremely excited to unveil the first recipe with my favorite superfood, colostrum. Why am I enthralled with colostrum? Why is it considered nature’s perfect food? Every mammal produces colostrum as the first food for their new born baby. That alone should tell you something. 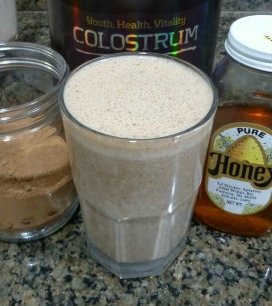 Colostrum is a complete whole food, containing immune factors, growth factors, and a bevy of nutrients including all essential amino acids, fatty acids, and glyconutrients. 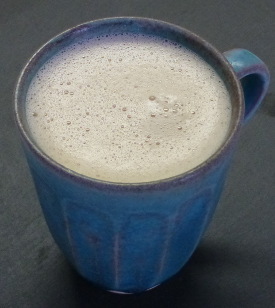 Colostrum, like coconut oil and chia seeds, is a staple ingredient in my smoothies and elixirs. This elixir features a superfood that has a special place in my heart. 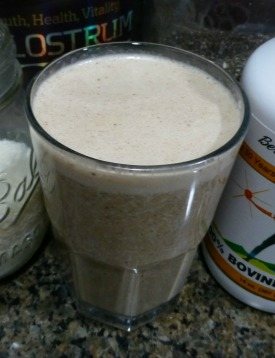 Maca was one of the very first superfoods I tried way back in the day. One of my primary health objectives at the time was increasing my energy levels. Maca delivered then and continues delivering to this day. Along with increasing my energy for normal day to day activities, I also experienced an increase in stamina and endurance when playing basketball and working out. While harder to gauge, I’m sure maca contributed to boosting my immune system as well. These are the benefits I experienced from maca. It’s known for many additional health benefits which I’m sure other people can personally attest to.